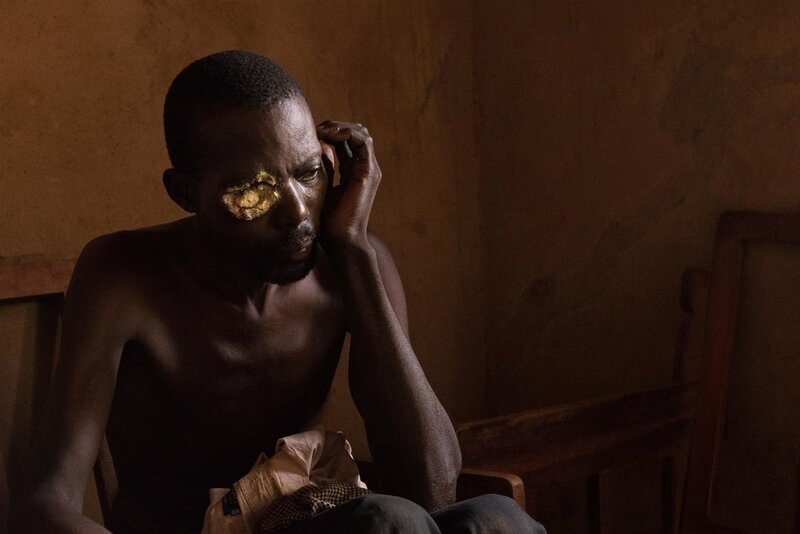 With his shoulders hunched forward and his hands curled over the curve of the steering wheel, James Isabirye scans a dusty road in southern Uganda for signs of life. The driver at Hospice Jinja is looking for a narrow inlet, somewhere between a neighbourhood shop and a primary school, that his colleague and passenger Esther Apolot is directing him to. Harriet Namuwoya and her mother pose for a photo inside their home in the Busoga region of Eastern Uganda. The 32-year-old mother was diagnosed with abdominal cancer last year. Nurses believe her watermelon-sized abdominal tumor would have responded favorably to radiation therapy had the 21-year-old machine remained operational. Uganda’s only external beam radiotherapy machine broke last April and has not been replaced since. Nurses with Hospice Jinja hand Grace Auma her monthly allowance pain medication to reduce pain caused by advanced-stage cervical cancer. Auma began receiving care from Hospice Jinja in October 2016, seven months after Uganda’s only radiotherapy machine broke. If you want to understand the effect of Uganda’s last radiotherapy machine, just look into the face of Musa Gali, said Sylvia Nakami at Hospice Jinja. The 45-year-old farmer was diagnosed with ocular melanoma last year but only received one round of cancer therapy at Mulago Hospital in Kampala before the machine broke down. “Because of that machine not being there, he is going to die in a terrible state,” said Nakami. Hospice nurses examine a tumor on Monica Nakayima's abdomen. The 45-year-old mother complained of weakness caused by heavy pelvic bleeding, likely a symptom of ovarian cancer. Unable to afford treatment in neighboring Kenya, Nakayima stays alone inside thatched-roof hut in Eastern Uganda. Monica cries inside her home in Jinja, Uganda. Hospice Jinja is one of the only nonprofits in the region that focuses on “death and dying with dignity”, said operations manager Sylvia Nakami. Hospice Jinja provides free medical care, pain medication and face-to-face counseling to more than 400 patients. Florence Nabeeta’s daughter sprinkles antibiotic medication her mother’s tumor, located above her left breast. Nabeeta was one of nearly twenty patients visited by nurses at Hospice Jinja everyday, many of whom have treatable forms of cancer but are unable to seek treatment in neighboring Kenya. Chris Waako, 50, winces in pain after running out of liquid morphine earlier that week. Diagnosed with colon cancer last year, Waako, was unable to afford a $210.00 colonoscopy and $111.00 CT Scan, which doctor’s said were necessary before he could receive cancer radiation treatment. Now, Waako depends on medication provided by Hospice Jinja to cope with pain associated with the disease. Kasita Nabiuye, 50, receives two bottles of morphine to control pain from advanced stage breast cancer. Public hospitals in Uganda rarely stock liquid morphine or other pain medication said Dr. Paul Kibirige, a physician at Bumanya Health Centre. Kibirige said his clinic, which serves 20,000 patients in eastern Uganda, “can’t do much” for patients dying from cancer. “Really, they need to go to Nairobi for treatment, but in this region no one can do that so they die in pain,” he said. Joyce Matama, 80, thanks hospice nurses for bringing medication to relieve pain caused by cervical cancer. “Today, the pain is controlled,” nurses reported. Matama is one of 414 patients benefiting from Hospice Jinja’s pain management and end-of-life care. “Still, I think there are many, many more who need our help,” said operations manager Sylvia Nakami.